Doubleday Books for Young Readers, 9780385385329, 32pp. Yo, ho, ho! It’s bedtime! But this little swashbuckler will do anything to avoid going to sleep. Read along as he stalls for time—searching for peg-legged Captain Teddy, stowing his toys in the ship’s treasure chest, and even playing a game of walk-the-plank! Snuggle up with your own little pirate for a fun and delightful high-seas adventure as you wind down your exciting day together. 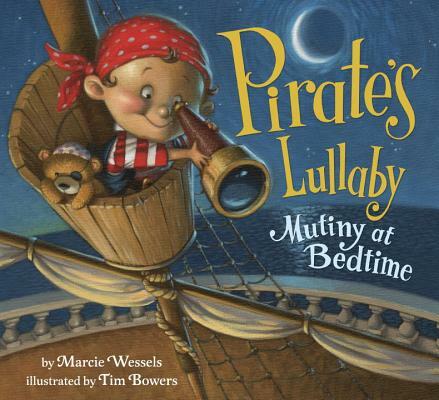 MARCIE WESSELS is the author of Pirate's Lullaby. She received a BA in English and Spanish from John Carroll University, an MA in Spanish from Bowling Green State University, and a PhD in Latin American literature from Tulane University. She has taught Spanish language and literature at the University of San Diego. She lives with her husband and their two children in San Diego. Vist Marcie online at marciewessels.com. TIM BOWERS studied at the Columbus College of Art & Design and started his career in an advertising art studio before being recruited by Hallmark to design greeting cards. Since then, he has illustrated over thirty-five children’s books, including Pirate's Lullaby and the New York Times bestsellers Dream Big, Little Pig!, written by Kristi Yamaguchi, and Dinosaur Pet, written by Neil Sedaka and Marc Sedaka. His book illustrations have received many state and national awards. He and his wife live in Granville, Ohio. Learn more about Tim's work at timbowers.com.